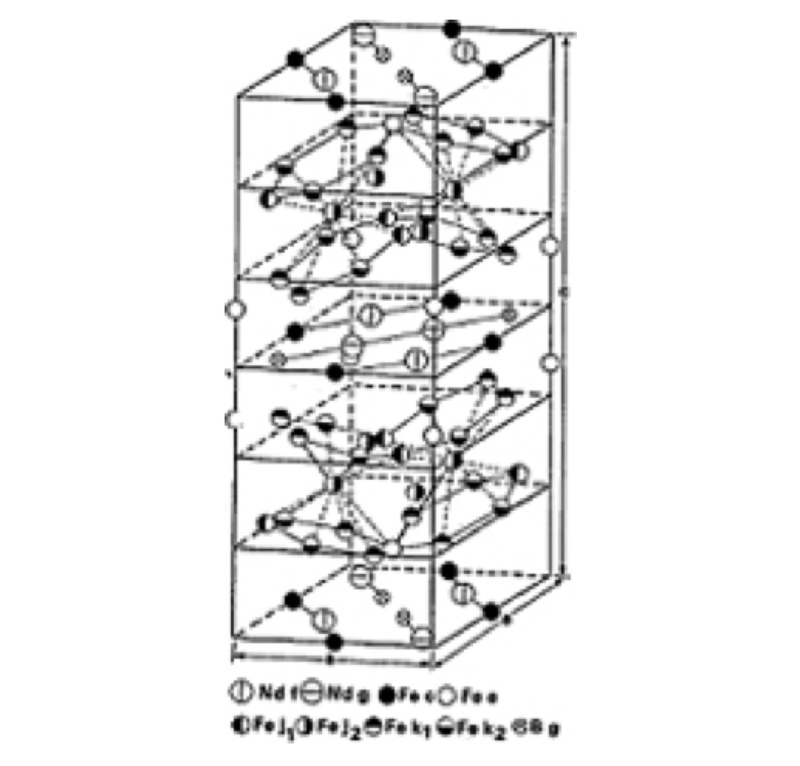 The superior permanent magnet properties of all are rare earth (RE)-iron (Fe)-boron (B) materials are derived from the strong magnetocrystalline anisotropy and high saturation magnetization of the intermetallic compound RE2Fe14B1, a tetragonal crystal structure discovered and patented in the 1980’s. Due to the excellent magnetic properties achieved and its relative abundance, the most commonly used RE element is Neodymium (Nd), although other elements such as Praseodymium (Pr), Lanthanum (La) and Cerium (Ce) are sometimes also used. MQP™ powders are based upon Magnequench’s patented RE-Fe-B alloy compositions that are rapidly solidified from the molten state at extremely high cooling rates, on the order of 1,000,000 degrees per second. This rapid solidification results in a material which has an extremely fine (typically 30-50 nanometer) randomly oriented, metallurgical grain structure making them isotropic. Because the consequent grain size is smaller than the critical size for a single magnetic domain, these materials retain excellent magnetic properties in a powder form. making MQP™ powders ideally suited for the production of bonded permanent magnets. How is MQP™ powder produced? MQP™ powders are produced by a process known as melt spinning. 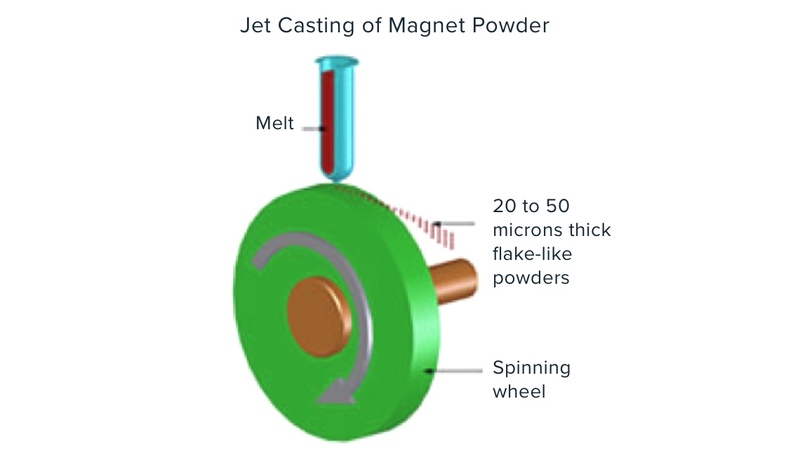 In the patented Magnequench melt spinning process known as Jet Casting, an ingot of RE-Fe-B alloy is first melted, then the molten metal is ejected under pressure from a nozzle onto the surface of a water cooled rotating metal wheel. The material solidifies into a thin metal ribbon which is approximately 35 μm thick and 1-3 mm wide. By carefully controlling process variables such as the metal flow rate and speed of the rotating wheel, the quench rate (and hence microstructure) can be controlled to achieve optimum magnetic properties. The ribbon is collected and then milled into a platelet- or flake-shaped metal powder, which is heat treated to obtain the desired magnetic properties. Magnequench also manufactures and sells very fine powder grades (MQFP powders). These powders are produced by jet milling MQP™ powders. The technology employed results in little magnetic degradation and is applicable to all MQP™ powder grades (with the exception of MQP-S-11-9). How is MQP™ powder used? Magnequench’s MQP™ powders are used in the production of bonded RE-Fe-B permanent magnets. Bonded magnets are composite materials produced by mixing magnetic powder with a polymer binder, then forming a shaped magnet part by compression molding, injection molding, extrusion or calendering in which magnetic particles are interspersed within the bonding matrix. Many different types of binders and forming methods can be used, and this high degree of flexibility is one of the most important advantages of bonded magnets, offering significant opportunities for high volume, low cost manufacturing of magnetic parts or assemblies. After the bonded magnet is formed, it is magnetized using equipment that generates an appropriate applied magnetic field needed to impart the permanent magnetic properties to the material. Because MQP™ powders are magnetically isotropic, there is tremendous flexibility in terms of the magnetization patterns and orientations that can be created; for example, multipole ring magnets are widely used in motor applications. By combining the advantages of both the flexibility in manufacturing and magnetization in their designs, application engineers are often able to achieve improved efficiency and reduced costs by using bonded magnet solutions. How is MQA Powder Produced? The performance of melt spun RE-Fe-B powder can be significantly enhanced by Magnequench’s anisotropic powder process. This process imparts a texture on the nanostructure of the melt spun material and gives it superior performance in one particular orientation, or anisotropic performance. The manufacture of anisotropic powder involves consolidating the melt spun powder into large cylinders and then die-upsetting these into shorter, wider plates. These plates are then crushed to a desired particle size and this powder is then given a protective surface treatment to maximize thermal stability. This anisotropic MQA powder can then be mixed with an appropriate binding material, typically epoxy for compression molding and nylon for injection molding. The MQA powder/polymer composite mix can then be introduced into a molding die, aligned with an in-situ magnetic field and consolidated while the magnetic field holds the MQA powder particles in a preferred direction. There are a number of variations to the molding technique related to die geometry, temperature and applied field, and these will depend on the magnet manufacturer’s preference.